The Mehndi ceremony was held on the evening of day 2 of the celebrations. To read about the ceremonies held in the previous day, click on the link below. Mehndi started in the evening.The house had been decorated with fairy lights and Aepan (Alpana). 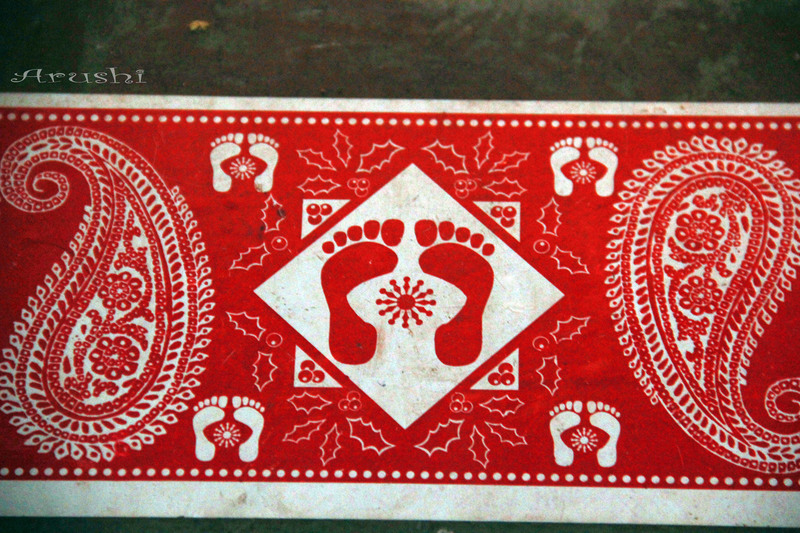 Aepan is a type of rangoli made in Kumaoni homes for pujas, festivals and ceremonies. Aepan are traditionally made by hand with geru (filtered red earth powder) and rice paste. But, now-a-days patterns are available as stickers (as shown in the below picture) . You can also see different types of aepan here and here. Didi was looking lovely in a pink suit. Room was full of DSLRs, with both the official photographers and the photography enthusiast friends trying to capture every moment of the occasion. The Mehndi artists commented on how this was the first time they have seen so many photographers covering the occasion. Well, I must say didi was looking divinely beautiful. The Mehndi was put on both her hands and feet. The designs were intricate and beautiful. Application of Mehndi is an age-old tradition in Indian weddings. Mehndi is actually Henna paste that stains the skin temporarily (in reddish-brown colour) and is considered a type of ornamentation. Henna leaves are dried, ground to a fine powder and mixed with lemon juice and essential oils to form a paste. Mehndi art is centuries old but it seems to have originated from somewhere around Egypt. Now-a-days, ready-made Henna cones are used for mehndi application as they are easier to paint with, and eliminate the Mehndi preparation time. But, in parts of rural areas in India, women still grind fresh henna leaves on grinding stones with added oil, which is not as refined as the professionally prepared henna cones, but achieves much darker colors. After the artists finished decorating Didi’s hands and feet, they also applied the mehndi on the hands of the ladies of the family, and on the hands of the close friends. Ladies sang traditional marriage songs at a corner of the room while Mehndi was being applied. This entry was posted in Weddings and tagged aepan, bride, kumaoni wedding, marriage, mehndi, wedding, weddings. Bookmark the permalink.